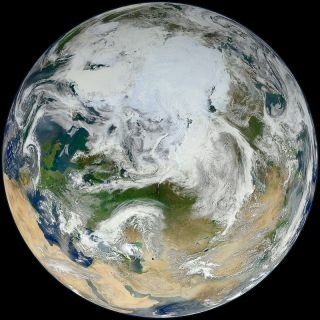 The 'blue marble' of earth gets a makeover in this view of the arctic as seen by the Suomi NPP satellite. Image released June 18, 2012. With a heat wave roasting parts of the United States this week, it may seem strange that our planet is now actually at its farthest point from the sun this year. Strange, but true. According to the U.S. Naval Observatory, the Earth will reach a point in its orbit called "aphelion" at 12 a.m. EDT (0400 GMT) on Thursday (July 5). The Earth's aphelion is the spot where it is the farthest from the sun that it can get in a single year — about 94.5 million miles (152 million kilometers). To put that in perspective, the Earth is typically about 93 million miles (150 million km) from the sun. But because our planet's orbit is not a perfect circle (it's actually an ellipse) it has a farthest point and closest point to the sun. Earth's closest approach to the sun is called perihelion and occurs in early January. If you're in a heat-wave state in the United States, you may be wondering how it can be so hot if Earth is farther from the sun than it usually is. It's a good question. But our current warm weather isn't directly tied to Earth's relative distance from the sun; rather, the 23.5-degree tilt of Earth's axis is playing a major role. This tilt means that the sun is above the horizon for different lengths of time during different seasons. It's this tilt that determines if the sun's rays strike your spot on Earth directly or at a low angle. At the latitude of New York City, the sun's direct rays on the June 21 summer solstice mean the city receives three times as much heat as it does during the winter solstice in late December. The reverse is true for the Southern Hemisphere, where it is currently winter. The dates for aphelion and perihelion can vary by a few days. Perihelion typically occurs between Jan. 1 and 5, and aphelion ranges between July 2 and 5. While this year's aphelion occurs on July 5, last year it was on July 4, just in time for the Fourth of July celebrations marking the Independence Day holiday in the United States. So tonight, after catching your local fireworks display to celebrate the Fourth of July, take a moment to mark another annual event on Earth: aphelion. We'll only get closer to the sun from here.